Before you even launch Tweetbot, you’ll notice that the icon has been changed to reflect the style of the Mac app. After years of variations on the old icon, it’s taken some getting used to the new one, which I think looks angry, but whether you like the new design or not, I like having the same icon on both platforms. A comparison of Tweetbot 4's timeline and profile views to the new ones in Tweetbot 5. The iconography throughout Tweetbot 5 uses a thicker stroke like the Mac app, which gives the icons more weight and a bolder look. When you open a tweet’s detail view, Tweetbot now indicates whether the person whose tweet you're viewing follows you, though it doesn’t do the same for other tweets if the one you opened is part of a thread. Profiles have been redesigned too. Avatars are bigger and to the left of your bio, profile backgrounds are now clearly visible, the text is left-justified, and follower and following statistics are more prominent. The changes take up more vertical space but are easier to read and look nicer than in the past. 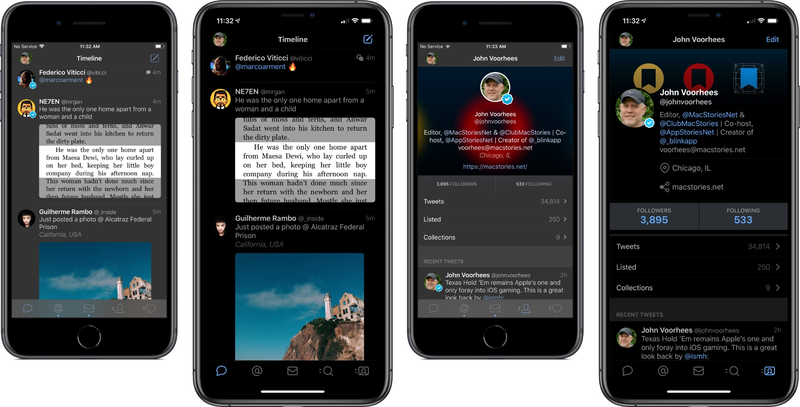 Lastly in the area of design, there’s a new dark mode throughout the app that looks much better on OLED iPhones than Tweetbot 4’s dark mode. 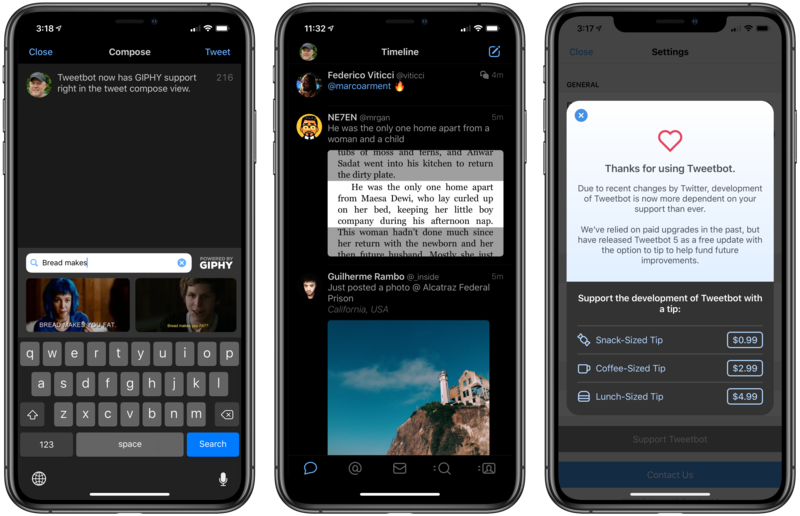 Tweetbot 5's tweet detail view (right) shows off the new dark mode, bolder icons, and auto-play GIFs. In addition to the redesign, Tapbots has added a few new features to Tweetbot 5 too. 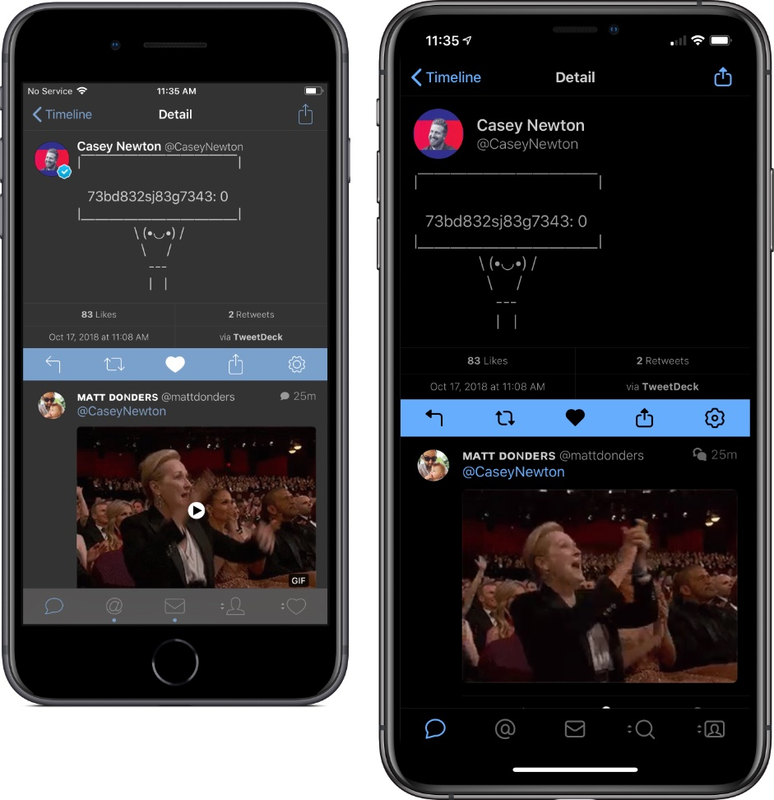 Like the Mac app, Tweetbot on iOS can now autoplay GIFs and video. The feature is turned on by default but can be turned off in settings. GIFs are easier to add to tweets too. There’s a GIF button in the compose view that opens a GIPHY search field when tapped. Descriptions can be added to images from the action sheet that opens when you tap on an image in the tweet you’re composing, which is an excellent accessibility addition for VoiceOver users. Tweetbot has added haptic feedback throughout the app too. Finally, there is a new tip jar feature in Tweetbot’s settings that lets users make a $0.99, $2.99, or $4.99 tip to support the development of the app, which is something that Twitterrific started doing a couple of years ago. From a feature standpoint, Tweetbot 5 is a modest update, but one that I’ve enjoyed using during the beta. The dark mode looks much better on OLED phones, and the design changes give the app a fresh new feel. I wasn’t sure I’d like the addition of auto-play video, but I’ve been pleasantly surprised to find I do, though it’s easy enough to turn off if you don’t. The haptic feedback is another good addition that provides a subtle tactile response to actions taken in the app. Tweetbot 5 is a free update for existing users and is available on the App Store.